This personalised leather iPad case is made from the finest Italian Nappa leather, making it a premium gift for a loved one. It keeps your iPad in pristine condition, protecting it from scratches and smashes. Customise your leather iPad cover for personal use, a special birthday or 3rd wedding anniversary. Using soft Italian Nappa leather, we print, hand cut and hand stitch your photo iPad case to order, making a beautiful protective cover for your device. You get to customise both the back and front with your photos, artwork, slogans & graphic designs. They fit all iPads (except the Minis), even with an Apple cover on, so you can easily create one for all the family. These were great. I liked the Ipad covers, I hope to order more. Like many of our products, the personalised leather iPad case comes with a quantity discount, so buy more than one today and save money. Your images are printed onto sheets of bespoke Italian leather using a specialist digital process that binds the ink to the leather, creating a long-lasting, vibrant print. Your leather iPad cover is carefully cut to size leaving a small indent for the thumb - designed to help you remove the iPad with ease. Our team of expert seamstresses hand stitch the cover together ensuring the finish is of the highest standard. The interior is left unlined, so the soft surface protects the screen and back from scratches. You'll notice a small semicircle cut out at the top of the case, designed to let you get the device out smoothly. Make sure important details of your image aren't placed where this thumb cut-out is, such as facial features or bits of text. Also, keep your main design features away from the edges as this is where the stitching occurs. We always carefully source and select the best quality Italian Nappa leather that'll produce a flawless print. Because it's a natural product, we can't prevent the visible grain, pockmarks and patina but this adds to the authenticity and charm of your personalised leather iPad case. Important: We advise against solid blocks of colour all over as this can appear patchy on the natural leather. Photos, patterns and text produce the best results. Each photo iPad case is made using bespoke pieces of leather, so there will always be variations in texture, surface and feel between any two cases. 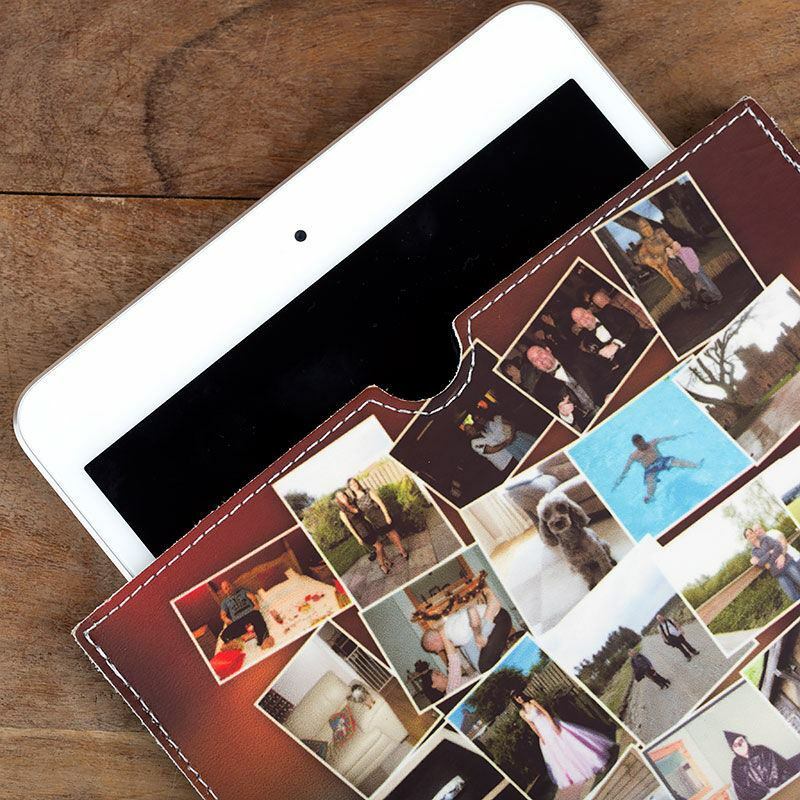 iPad cases printed with photo collages make such original gifts for loved ones. As a 3rd wedding anniversary present, give your husband or wife a sentimental, but seriously useful, leather iPad cover. Using photos from the big day, it's a fun way to reminisce over the years you've shared at the same time as getting your work done. If you're a creative sort and use your iPad as a platform for artistry, print inspirational visuals or quotes to help encourage those eureka moments; "Creative Minds Are Rarely Tidy" or "Logic Gets You from A to B. Creativity Gets You Everywhere Else." For a corporate gift or to use at work, take this opportunity to promote your company further by printing the logo and branding on either side of your leather iPad case. When you're on client meetings or commuting to the office, it helps you maintain a smart, professional image. Custom iPad slip case. Personalised iPad sleeve printed with photo both sides. Superb print on silky cushioning material. iPad stand wedge. Our iPad stands are custom printed. An iPad holder with a difference. Be even more exclusive and print your own design on the new iPhone X cover. Shatter-proof and high-end materials.